There’s nothing quite like seeing the magic of Christmas through a child’s eyes. The way they relish in the trees, the lights, the carols, the cookies, and of course, our dear friend from the North Pole. You can keep that feeling alive even when navigating the holiday hustle & bustle with little ones. I love shopping at Park Royal year-round, but there is just a special magic here during the holiday season. Parents listen up; If you want to win at holiday shopping with your kids in tow (which of course you do! ), skip the pandemonium of downtown, grab your gingerbread latte, and head to Park Royal. Why Park Royal you ask? Well, many reasons, but the foremost of which is that you can complete all of your Christmas shopping in one fell swoop, including a visit to Santa (Fastpass, please!) and even enjoy a lovely lunch or dinner at one of their many restaurants. I recently set out on my very own venture through Park Royal for some holiday shopping with my two boys; 2-years and 2-months. Leaving the chaos of the city and visiting the North Shore was a welcomed exchange and I was promptly greeted by ample free parking which was my first sigh of relief. We were off to a good start! I particularly love the beautiful outdoor parts of Park Royal, so that was where we began. We always find plenty of gems in Zara and Zara kids and this trip was no exception. Gifts for dad and nieces/nephews, check. A new pair of grey jeans for Aspen, my 2-year-old, and a holiday dress for mama; check, check. Next, we were on to H&M to check out their kid’s department. I love their Conscious line of clothing; it’s all organic cotton and fits really well. I found the cutest little Christmas outfit for my baby Hayes, and Aspen procured a statement sequin Santa hat! And because I was traveling with two always-hungry boys, we headed straight to Simons for a refuel and rest in their chic Eve Café. What a beautiful relaxing atmosphere with great coffee and incredible sandwiches. I found the environment the perfect combination of relaxing and festive – now on to see Santa! I’ve had my share of standing in line for over an hour to see Santa with kids, so I was thrilled to learn about the Santa’s Fastpass program at Park Royal. You just go to the Park Royal website and book an hour timeslot and you’ve got a fast track to the front of the line to see jolly ‘ol St. Nick – voila! And if for some reason your kid jumps in mud or spills soup down their dress (or insert the myriad of 12,000 other things that can happen to derail your Santa photo plans), no sweat! You can go online and simply reschedule your reservation. It’s as if they get what real-life with kids is like! When we arrived to see Santa, we were greeted by the sweetest set all decorated by Urban Barn. It was cozy and welcoming and felt like we were snuggled up in Santa’s North Pole living room. Santa took some time getting to know Aspen and making him feel comfortable although baby Hayes seemed to take more of a liking to him. Before we left, Santa started handing out Lindor chocolates from Lindt and candy canes it was then that Aspen’s heart was immediately won over. And mama’s too if I’m being honest! We had one last shopping stop to make, at one of my favourite places, Saks OFF 5TH in Park Royal North. I love this discount designer store as you can really make your dollars go far! They’ve got so many great brand-name pieces and something for literally everyone including great host gifts for all your holiday parties. Shopping was wrapped up and the boys did great thanks to the ample places to keep them occupied and the multitude of places to keep them fueled up with snacks and treats. We all needed a nice treat after a big day of shopping so we headed to Trattoria for a delicious Italian meal to top off a long day. We went home satiated from delicious food and mama feeling happy and majorly accomplished – what a great day! 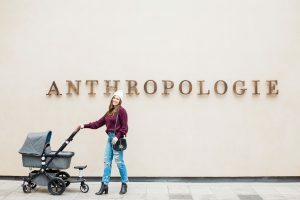 There are plenty of shopping options in Metro Vancouver, but I find Park Royal to feel more like a destination rather than a mall with every option you could possibly ask for right at your fingertips and in such a beautiful setting – the perfect destination for shopping with kids.